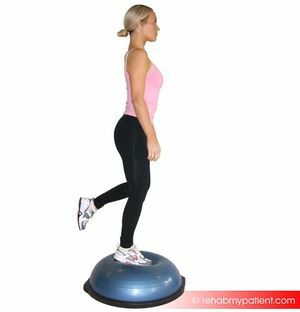 In physiotherapy a balance or wobble board is used for balance, athletic, postural, coordination and falls prevention training. It is a circular object with an uneven base, on which the user attempts to balance. It is used to prepare people to: avoid injurious falls; to prevent sports injuries especially to the ankle and knee and for rehabilitation. Over the years they have become very popular with many sports training people for eg snow boarders, hockey players, footballers. They are used in physiotherapy departments for various lower limb rehabilitation programs and for balance and fall prevention programs. They also are now being marketed for use at standing desks to keep workers more alert and improve fitness. The tilt angle ie the angle created when one edge of the board touches the ground. The size of the board. The larger the easier. Seniors training for falls prevention. A 2011 study found that wobble board training is effective for elderly people to improve their standing balance Studies have also shown that the use of a balance board three times a week can reduce risk of falls in the elderly population. Lower limb strengthening and rehabilitation following lower limb injuries. Watch the below video clip showing balance boards use in rehabilitation and sports training. Excuse the bit of a promotion for a certain type of board. Using a balance board to train your upper extremities can improve balance, stability and proprioceptive awareness. Be sure your client can perform these exercises eg pushups, with good form without a balance board first or they run the risk of injuries to shoulders, elbows or wrists. Having a strong stable core is essential for good functional activities and injury prevention. A balance board is a great tool to help with core stabilisation and strengthening. If you don't have access to a balance board you can try using a soft pillow or foam matting. Another option is to make your own.